A post inspired by our friends at Just a Rough Draft, where they blog about creative concoctions and exotic foods they encounter from around the world, we turn this week to a recipe made from scratch. While on our recent week’s vacation to Slovenia, we learned a lot of things about the Slovenes. They are high adventurists, Slovenes can be found doing just about every adrenaline pumping activity on the planet. They are proud of their history, just about everyone we talked to had something to say about the late Yugoslav leader Tito, who ruled the country not with an iron fist, but a pragmatic approach to socialism; it was his leadership that kept the country together, and the absence of it that ultimately led to its demise. Most importantly for this blog post, we learned they are beekeepers. About 1 in every 250 Slovenes (or four per thousand) keep a hive for themselves which means in the fancifully quaint city of Bled, population 3,000, there are probably about 12. At the market in Piran, Slovenia’s coastal paradise, and in the capital Ljubljana (lyou-bYAHna), we found dozens of varieties of honey. Honey production has a long history in Slovenia, and apparently this is Slovenia's oldest bee hive. These movable wooden structures house thousands of bees. Absent minded bees who get so absorbed in visiting flowers they forget their way home have nothing to fear. 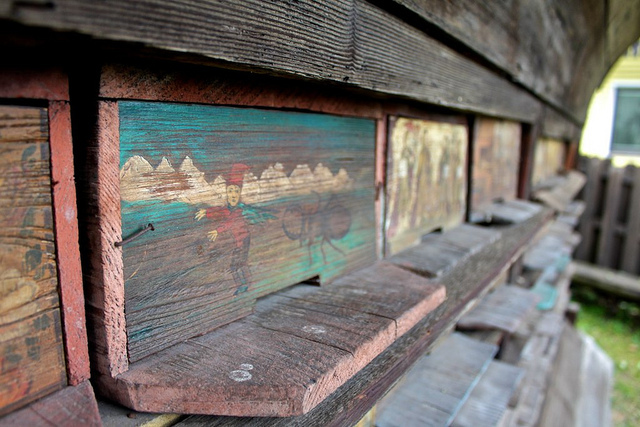 Each wood panel is painted differently by the bee keepers to help busy bees find their way home, often with snarky images, like the devil sharpening a woman's tongue. Near Bled, Slovenia. To be quite honest, before the honey festival here in Kaposvár at the end of September, I didn’t think much about the different sources of honey, only that it came from bees. It turns out that honey takes on a multitude of flavors and consistencies depending on what flower it comes from. At the honey festival we sampled many varieties, and in Slovenia decided, since it is such a part of the nation, to buy some real Slovenian honey. The linden tree has historical significance for Slovenia. Our tour guide in Bled, Tina, told us that back in the day the linden tree and a point of religious significance marked the center of town. The linden tree functioned essentially as a city hall. Around the tree were arranged large stones. During the day the women of the village would gather there to hang laundry and talk, and by evening it became a public forum—mostly populated by men, from the sounds of things—for anyone in the village. The stones signified a seat for each of the village’s farms. People would gather under the linden to discuss issues of public importance. As a rhetoric person, I found this wonderful. After hearing so much about the tradition of bee keeping in Slovenia, we knew we couldn't head home without some honey weighing down our suit case. In Ljubljana we were overwhelmed by all our choices, and finally committed to a delicious jar of Linden Honey from a small market in Piran, Slovenia. Its flavor packed a tasty punch in a batch of bread. Linden was a natural choice then, for our honey purchase. We could have bought just about any kind of honey one could dream up, but given the political and rhetorical importance, we gave linden honey a shot. Mix together flours, yeast and salt in a bowl. Any bowl will do, just make sure its big enough for the task. Add in the honey and water and mix first with a whisk, then by hand until the dough becomes a single mass. Pour the dough onto a floured countertop and knead for 10-20 minutes (or until your hands get tired). Add more flour (if it’s too wet) or water (if it’s too dry) if needed. When you are finished kneading the dough should be mostly dry: not sticky enough that it clings, but just enough so that you feel it peel off your hands. Set the dough in a lightly oiled bowl and let rise for as long as you like, but at least until it has doubled in size. Lightly cover the bowl with plastic wrap to keep the moisture inside. Preheat the oven about thirty minutes before you are done letting it rise. 500ºF (260ºC/Gas Mark 9) is a good temp if you’re fortunate enough to have an oven with a thermostat. You want the oven hot so you get a nice crunchy crust. Before you throw your loaf in the oven, pour the risen loaf out on a lightly floured counter top and shape it into your loaf. You can shape it however you like, but to get that baguette look, form it into a wide loaf, and fold it over itself. This will cause a gash looking formation that will allow steam to get to the middle of the loaf while it bakes. If you fold it over, pinch the ends of the loaf. You don’t want steam escaping, only circulating. Cover your loaf with a moist towel and let it rise again for 20 minutes. Bake for about 20 minutes, or until it sounds hollow when you tap it with your fingers. When you come home I want some baking lessons. It sounds like you know all the tricks mom never taught me. It’s all about trial and error, and apparently traveling to far away places to pick up esoteric ingredients. I enjoyed your article about Slovenian honey. Do you know how/where it can be purchased in the US? I have tried working through Slovenski Med and some of its beekeepers. Thank you. Unfortunately I do not know of any place to get Slovenian honey in the US. If you find out, let us know!